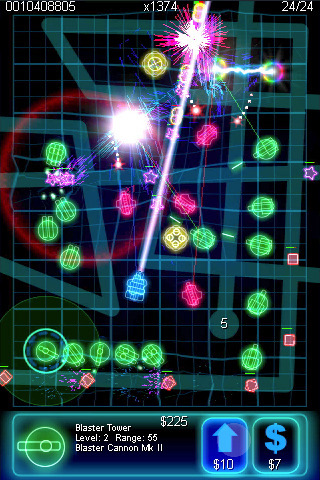 GeoDefense is a particle effect explosion of colors and vectors. Space distortion effects, beams of light and scattering pixels of doom—this is a feast for the eyes all packed into this fast and beautiful tower defense game. Released by Critical Thought Games, GeoDefense is available for $1.99 (with a Lite alternative) on the iPhone, iPod touch, and iPad. GeoDefense is a superb tower defense game. You have the towers that all have their own unique traits and uses, you have easy touch-create-upgrade controls, and you have enemies that follow a path right into your ‘castle’ that you must defend. The way this app turns itself into a feast for the eyes comes from the theme. It’s like a rainbow version of Tron with a dark grid-like background and glowing transparent towers, enemies, and projectiles. 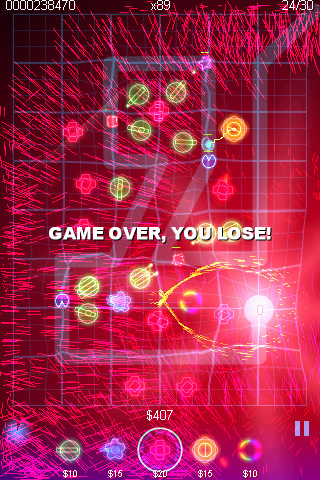 Each time an enemy is destroyed, a huge fire-work style explosion flashes and distorts the grid. The grid will bounce, catch lights, and shake to the intensity of each explosion. Combined, every intense battle becomes so much more eye catching. Towers all have their own upgrades with noticeable visual changes. For example, my favorite unit in the game is the laser cannon, which will damage all units that the beam touches. With one upgrade, I make the single beam more powerful. With the next upgrade, the beam splits off into two. The next upgrade makes the dual-beam stronger, then it splits to 3, which then gets more powerful with the next upgrade, and finally, you get a rapid-firing super beam that attacks the weakpoint for massive damage! Every unit has their own upgrades and once you see how strong they get at the maximum level, you’ll realize how each of the units are completely unique on their own. Sound is excellent. The explosions of the enemy really sound like they pack a punch. A lady will count down your life points with each surviving enemy that makes its way to your base and it can feel so intense to hear her say “3… 2… 1…” and you just barely kill the last enemy unit. Despite that there is no music; this is a great way to really focus in on the graphics since the boom of each exploding enemy unit is highlighted with the distortion and particle explosion. I love the visual appeal of this game. Too be perfectly honest, this is almost just like those ‘Doodle’ games, but with a darker, edgy, high-tech look and feel to it. The bright colors, the awesome graphics, the intense sound effects, and the absolutely spot on gameplay make GeoDefense one of the top games in the app store for good reason. I will also be covering its sibling app, GeoDefense Swarm. Not only will I go to say that that game is just as good as this one, I’ll go and say that that one is even better. AppSafari review of GeoDefense was written by Joseph Ho on September 20th, 2010 and categorized under App Store, Featured, Games, Tower Defense. Page viewed 3968 times, 1 so far today. Need help on using these apps? Please read the Help Page.